The UVA Health System strives to continually expand in all of our missions − patient care, education and research. To support this, we are actively engaged in improving our physical facilities, recruiting and retaining excellent faculty and staff, expanding our clinical programs, strengthening our recognized centers of excellence, and streamlining our processes for health care delivery. The Battle Building was completed in the summer of 2014. 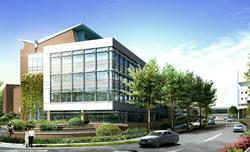 This seven story, 200,000 square-foot facility houses pediatric primary care, dozens of pediatric subspecialty clinics, a maternal and fetal medicine clinic, pediatric outpatient rehabilitation services, the teen and young adult health center, outpatient surgery, a clinical trials suite, and clinical research office all in one location with immediate proximity to the UVA Medical Center. Opened in 2011, the five-story, 150,000 square-foot Emily Couric Clinical Cancer Center provides state-of-the-art therapies and comprehensive cancer care to patients and their families − all under one roof. In 2012, the new Stem Cell Transplantation Unit opened and is having a significant impact on advancing the clinical, educational, and basic science programs in the Division of Hematology-Oncology. 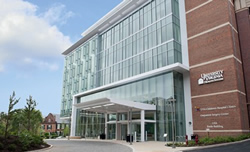 The opening of the North Unit Expansion of the University Hospital in 2012 added 72 ICU-capable private patient rooms and dedicated education space. 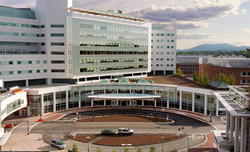 The UVA Health System uses EpicCare, an electronic medical record (EMR) in use at more than 50 U.S. academic medical centers. A team representing all clinical areas selected this program for its usability and comprehensive documentation of a patient’s medical history and treatment. 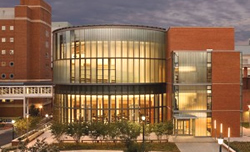 The 85,000 square-foot Claude Moore Medical Education Building serves as the central portal to the UVA School of Medicine and provides novel technologies and flexible teaching spaces to support innovative medical instruction. The facility includes specialized multimedia classrooms and Learning Studio, video-equipped exam rooms for analyzing student-patient interactions, and a Medical Simulation Training Center for honing skills. NIH support for medical research at UVA has grown significantly, and we are keeping pace with quality laboratory space. 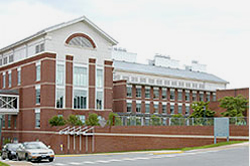 The 150,000 square-foot MR5 Biomedical Engineering and Medical Science Building and the 102,000 square-foot MR6 Carter-Harrison Research Building house laboratories for more than 700 researchers and technicians in biomedical engineering, pathology, cardiovascular sciences, cancer, immunology, allergies and infectious diseases.